The 5200 was an improvement in 8-bit graphics, but the controllers sucked and one was left with a box full of incompatible 2600 carts. The 7800 resolved this with a short-lived supply of new titles and the ability to play 2600 games as well. Sadly, the 7800 was another Atari game console I missed out on when it came to market. Again I sought out Best Electronics to hook me up with a used console that is still working to this day - unlike my PlayStation which died from the tragic affliction of "too many moving parts to endure". The Atari 7800 ProSystem, or simply the Atari 7800, is a video game console re-released by Atari Corporation in January 1986. The original release had occurred two years earlier under Atari Inc. 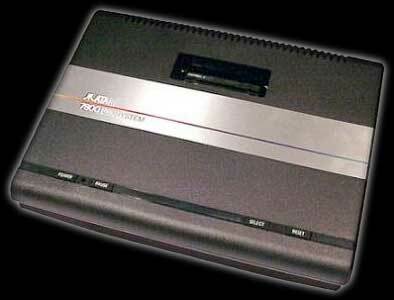 The 7800 was designed to replace Atari Inc.'s unsuccessful Atari 5200 and later to re-establish Atari Corp.'s market supremacy against Nintendo and Sega. With this system, Atari Inc. addressed all the shortcomings of the Atari 5200: it had simple digital joysticks; it was almost fully backward-compatible with the Atari 2600; and it was affordable (originally priced at US$140). The Atari 7800 ProSystem was the first game system from Atari Inc. designed by an outside company, General Computer Corporation (GCC). The system had been designed in 1983 through 1984 with an intended mass market rollout in June 1984, but was canceled shortly thereafter due to the sale of the company to Tramiel Technology Ltd on July 2, 1984. The project was originally called the Atari 3600, though was later renamed the Atari 7800. Several key factors influenced the design of the 7800. First, Atari had been facing mounting pressure from the ColecoVision, which boasted graphics that more closely mirrored arcade games of the time than Atari's reigning 2600 VCS system. Second, the Atari 5200 (the original intended successor to the Atari 2600 VCS) had been widely criticized for not being able to play Atari 2600 VCS games and for the poor quality of its analog joysticks. Finally, dropping prices of home computers like the Commodore 64 had caused many to believe that buying a home computer was a better investment because it provided more detailed gameplay and could be used for other purposes such as word processing. Previous game consoles sometimes had a difficult time replicating the arcade experience in home versions of popular arcade games. In particular, home versions of arcade games sometimes had problems with flickering and slow down when more than a few moving objects appeared on the screen at once. GCC, which had a background in creating arcade games, designed their new system with a graphical architecture similar to arcade machines of the time. The 7800 featured the ability to move around a tremendous amount of objects (75-to-100) that far exceeded previous consoles. Powering the system was an Atari SALLY 6502 (Atari's slightly custom 6502, sometimes described as a "6502C") processor running at 1.79 MHz, similar to the processor found in home computers (Atari 8-bit, Apple II, Commodore 64) and other consoles (Atari 5200 and Nintendo Entertainment System). To enhance the gaming experience further, GCC had also designed a 'high score cartridge,' a battery-backed RAM cartridge designed for storing game scores. On the side of the 7800 was an expansion port, reportedly for a planned connection with a laserdisc player. The 7800 was initially released in southern California in June 1984, following an announcement on May 21, 1984 at the Summer Consumer Electronics Show (CES). Thirteen games were announced for the systems launch, including Ms. Pac-Man, Pole Position II, Centipede, Joust, Dig Dug, Desert Falcon, Robotron: 2084, Galaga, Xevious, Food Fight, Ballblazer, Rescue on Fractalus!, and Track and Field. Atari was a sponsor of the 1984 Summer Olympics and planned to push the 7800 aggressively in time for Christmas that year. One month later, Warner Communications sold Atari's Consumer Division to Jack Tramiel. All projects were halted during an initial evaluation period. The Atari 7800 languished on warehouse shelves until it was re-introduced in January 1986 after strong 2600 sales the previous Christmas. Atari's launch of the 7800 under Tramiel was far more subdued than Warner had planned for the system in 1984 with a marketing budget of just $300,000. Additionally, the keyboard and high score cartridge were canceled, the expansion port was removed from later production runs of the system and, in lieu of new titles, the system was launched with titles intended for the 7800's debut in 1984. The strengths and weaknesses of the 7800's graphics are often debated. The graphics are generated by a custom Graphics Processing Unit called MARIA (a name chosen to represent its succession from the Atari 2600's graphics and sound chip, TIA ... TIA-MARIA). MARIA is very different from other second and third generation consoles, which made it more difficult for game programmers to make the transition. Instead of a limited number of hardware sprites, the MARIA allows for a much larger number of sprites described in a list of display lists. Each display list contains sprite entries with pointers to graphics data, color information, and horizontal positioning. The same display list is used for multiple rasters with the pointers being automatically adjusted. However, managing and displaying a large number of sprites required much more CPU time (both directly and indirectly since the MARIA would halt the CPU when drawing sprites) than consoles with hardware sprites and backgrounds. MARIA has a number of different graphics modes which are either 160 pixels wide or 320 pixels wide. While the 320 pixel modes theoretically enable the 7800 to create games at higher resolution than the 256 pixel wide graphics found in the Nintendo Entertainment System and Sega Master System, the intense processing demands of MARIA typically meant that programmers created their games using the lower 160 pixel modes. The 7800 features a broad (for its time) palette of 256 colors. Depending on various parameters, each individual sprite can use from 1 to 12 colors, with 3 colors (plus a 4th "transparency" color) being the most common. In this format, the sprite is referenced to one of 8 palettes, where each palette holds 3 assignable colors. There is also an assignable background color, which will be visible wherever another object has not covered it up. In total the system can utilize 25 colors on a scanline at one time. The graphics resolution, color palette assignments, and background color can be adjusted in between scanlines. Although it is a more advanced programming technique, this isn't really a "trick". The designers deliberately included this feature, and documented its use in the original 1983 "Atari 3600 Software Guide". Games often used this feature to render high resolution text in one area of the screen, while displaying more colorful graphics with less resolution in the gameplay area. Demos also exist which use this feature to place all 256 colors on the screen at the same time. The MARIA's approach had advantages and disadvantages when it came to generating graphics in software during the lifespan of the 7800. It excelled at moving around large numbers of sprites on a static screen without the screen flickering that plagued other 8-bit systems. Its flexible design enabled it to play games which used display list manipulation to generate a pseudo 3D appearance such as Ballblazer (1987) and F-18 Hornet (1988). While side-scrolling games in the vein of Super Mario Bros. are possible on the system (1990's Scrapyard Dog is the best example), it is significantly harder to develop such a title than on a tile-based system such as the Nintendo Entertainment System. A common criticism of the 7800 regards its use of the TIA to provide 2-channel sound effects and music, resulting in sound quality that is virtually identical to the Atari 2600 VCS from 1977. While the inclusion of 2600 hardware is required to maintain compatibility with the older system, this drove up production costs and reduced available space on the 7800's motherboard. As such, the 7800 does not include additional hardware for generating sound as it does with graphics and the sound hardware is considered the weakest part of the system. To compensate for this, GCC's engineers allowed games to include a POKEY audio chip in the cartridge which substantially improved the audio quality. To ensure software developers had an economical means of producing better sound than TIA, GCC had originally planned to make a low-cost, high performance sound chip, GUMBY, which could also be placed in 7800 cartridges to enhance its sound capabilities further. This project was cancelled when Atari was sold to Jack Tramiel. Despite having the capability to support sound chips in cartridges, almost no 7800 cartridges feature POKEY hardware for enhanced sound. Ballblazer, released in 1987, uses the POKEY to generate all music and sound effects. Similarly, Commando, released in 1989, uses a POKEY to generate in-game music while the TIA generates the game's sound effects for a total of 6 channels of sound. Following the debate over Custer's Revenge, an Atari 2600 VCS title with adult themes, Atari had concerns over similar adult titles finding their way onto the 7800 and displaying adult graphics on the significantly improved graphics of the MARIA chip. To combat this, they included a digital signature protection method which prevented unauthorized 7800 games from being played on the system. The Atari 7800 differs from the 2600 in several key areas. It features a full Atari SALLY 6502 processor whereas the 2600 VCS has a stripped down 6507 processor running at a slower speed. It has additional RAM (Random Access Memory) and the ability to access more cartridge data at one time than the 2600. The most substantial difference, however, is a graphics architecture which differs markedly from either the Atari 2600 VCS or Atari's 8-bit line of computers. The 7800's compatibility with the Atari 2600 is made possible by including many of the same chips used in the Atari 2600. When operating in "2600" mode to play Atari 2600 titles, the 7800 uses a Television Interface Adapter (TIA) chip to generate graphics and sound. The processor is slowed to 1.19 MHz, enabling the 7800 to mirror the performance of the 2600's stripped-down 6507 processor. RAM is limited to 128 bytes found in the RIOT and game data is accessed in 4K blocks. When in "7800" mode (signified by the appearance of the full screen Atari logo), the graphics are generated entirely by the MARIA graphics processing unit, all system RAM is available and game data is accessed in larger 48K blocks. The system's SALLY 6502 runs at its normal 1.79 MHz instead of the reduced speed of 2600 mode. The 2600 chips are used in 7800 mode to generate sound as well as switch and controller interfaces. While the 7800 can actually play hundreds of titles due to its compatibility with the Atari 2600, there was limited third party support for the 7800 and less than 100 titles were specifically designed for it. The 7800 debuted with "pre-crash" titles that were originally intended for the systems launch in 1984, games which seemed dated in comparison to the Nintendo Entertainment System by the time of its release in 1986. Atari responded by beginning development on new 7800 titles but their investment and production was very limited. Numerous 7800 games were quickly rushed to market resulting in games which were unpolished, lacking in features and underpowered in comparison to their Nintendo counterparts. In response to criticism about the lack of depth to their games, Atari began to use bankswitching by 1988, releasing 64K and later 128K (1 megabit) titles which were comparable to both Nintendo Entertainment System and Sega Master System games. By the end of the system's life cycle, most games were 128K in size, with a few being 144K. While the system was certainly capable of playing even larger games (4 megabit and beyond) no games of that size were developed. At the time, a key driver for success with a home console was the number of home conversions it had of popular arcade games. This had been a primary reason for the success of the Atari 2600 VCS against systems like the Intellivision. During the Atari 7800's life cycle, Atari found themselves struggling to get developers to create 7800 versions of then-popular arcade titles because of a controversial policy employed by Nintendo. When Nintendo revived the industry, they signed up software development companies to create NES games under a strict license agreement which imposed serious restrictions on what they were allowed to do. One of the key clauses was that companies who made Nintendo games were not allowed to make that game on a competing system for a period of two years. Because of the market success of the NES, companies chose to develop for it first and were thus barred from developing the same games on competing systems for two years. The software libraries of the Atari 7800 and Sega Master System suffered tremendously as a result. The 7800 fared even worse due to the fact that Sega could draw from their own library of arcade hits in supporting the Master System (Atari's arcade division had been spun off into a separate company in 1984). The Atari 7800 was often forced to fill the void with either computer conversions or original titles, to varying degrees of success. Some NES titles were developed by companies who had licensed their title from a different arcade manufacturer. While the creator of the NES version would be restricted from making a competitive version of an NES game, the original arcade copyright holder was not precluded from licensing out rights for a home version of an arcade game to multiple systems. Through this loophole, Atari 7800 conversions of Mario Bros., Double Dragon, Commando, Rampage, Xenophobe, Ikari Warriors and Kung Fu Master were licensed and developed. A primary criticism of the Atari 7800's library is that many games on the system were also available elsewhere. Most of the original lineup of games had already appeared on either Atari's 2600, 5200, or 8-bit computers. This practice continued after Tramel Technology Ltd's takeover of Atari as 2600 and XE Game System versions (not ports) of 7800 games would be produced as well. Later, many titles exclusive to the 7800 would also appear on the Atari Lynx, though, again, not direct ports of the 7800 version. The Atari 7800's small library lacked key genres (role playing games), poorly represented ones(sports games), or had a disproportionate glut of specific ones (flight simulators). Third party development for the 7800 was limited as most game companies were locked into exlusivity agreements with Nintendo for the NES. Eleven titles were developed and sold by three third-party companies under their own labels for the 7800 (Absolute Entertainment, Activision, and Froggo) with the rest published by Atari themselves. However, most Atari development was contracted out. Unlike the NES or Sega Master System, there were few peripherals for the 7800. The most notable peripheral was the XG-1 lightgun, which came bundled with the Atari XE Game System. The XG-1 was fully compatible with the 7800 and was sold separately for other Atari systems. Atari released four 7800 light gun games: Alien Brigade, Crossbow, Meltdown, and Barnyard Blaster. In response to criticism over ergonomic issues in the 7800's Pro-Line controllers, Atari later released joypad controllers with European 7800s, which were similar in style to controllers found on Nintendo and Sega Systems. The 7800 included an expansion port which would have allowed for the addition of a computer keyboard, connection to laserdisc players to play laserdisc games and other peripherals. A dual joystick holder was designed for games like Robotron 2084 and future games like Battlezone and others, but not produced. The Atari 7800 remained officially active between 1986 and 1991. On January 1, 1992, Atari Corp. formally announced that production of the Atari 7800, the Atari 2600, the Atari 8-bit computer line, and the Atari XE Game System would cease. By the time of the cancellation, Nintendo's NES dominated the North American market, controlling 80% while Atari Corp. controlled just 12%. Despite trailing the Nintendo Entertainment System in terms of number of units sold, the 7800 was a profitable enterprise for Atari Corp., benefiting largely from Atari's name and the system's 2600 compatibility. Profits were strong due to low investment in game development and marketing. Nonetheless, the 7800 failed to help Atari regain its dominance in the videogame industry. When emulators of 1980s video game consoles began to appear on home computers in the late 1990s, the Atari 7800 was one of the last to be emulated. The lack of awareness of the system, the lack of understanding of the hardware, and fears about the digital signature lockout initially caused concerns. Since that time, however, the 7800 has been emulated successfully and is now common on emulation sites. One such program is ProSystem, written in C/C++ for the Microsoft Windows operating system. It uses Windows API and DirectX to display what it emulates in both PAL and NTSC. The digital signature long prevented homebrew games from being developed until the original encryption generating software was discovered. When the original digital signature generating software was turned over to the Atari community, development of new Atari 7800 titles began. In addition, the Atari community has slowly uncovered the original 7800 development tools and released them into the public domain. New tools, documentation, source code and utilities for development have since been created which has sponsored additional homebrew development. Several new commercial Atari 7800 titles such as Beef Drop, B*nQ, Pac Man Collection, Combat 1990, Santa Simon, and Space War have been created and released. Perhaps the most interesting recent development was the creation of the Cuttle Cart II, a device that allowed the Atari 7800 to read MMC cards containing binary files of Atari 7800 programs. The Cuttle Cart II has enabled more people to play the entire 2600 and 7800 library on an original system as well as binaries of unreleased games and new homebrew titles. The Cuttle Cart II was a success by homebrew standards, selling out both production runs and commanding high prices on Ebay. In 2004, Atari (now owned by Infogrames) released the first Atari Flashback console. This system resembled a miniature Atari 7800 and joysticks and had 20 built in games (five 7800 and fifteen 2600 titles). While the unit sold well, it was controversial among Atari fans. Atari had given the engineering firm, Legacy Engineering, extremely limited development timelines. The firm was forced to build the Flashback using NES-On-A-Chip hardware instead of recreating the Atari 7800 hardware. As a result, the Flashback has been criticized for failing to properly replicate the actual Atari gaming experience. Legacy Engineering was later commissioned to create another 7800 project that never made it to market. A reseller with millions of unsold Atari 2600 and 7800 games acquired from the Tramiels looked into remaking the system and bringing it to market as a way for new customers to play old Atari games. The project was cancelled after prototypes were made. As with most game consoles, there were many more games in development for the 7800 than were actually released. However, very few prototypes have been located, due to Tramiel Atari's reluctance to make them in the first place. Atari 7800 prototypes tend to be highly coveted by collectors, often fetching hundreds of dollars when sold. Some collectors are unwilling to share the rare items publicly as doing so risks decreasing the value of their prototypes. Nonetheless, some unreleased Atari 7800 games, as well as early versions of released games have been released to the public. A few have been manufactured and sold. Klax (Programmed by Blue Sky Software). The game was nearly completed when canceled. For years, it was traded privately until a ROM was made available to the general public. Later, the developer appeared to create additional levels for the community. Gato (Programmed by Ibid Inc Software). Released on the XE Game System, an Atari 7800 version was started but not completed beyond a simple demo. Missing in Action (Programmed by Sculptured Software for TNT Games). A side scrolling adventure that was about 85% complete when cancelled. The game is mostly playable with some later collision detection issues requiring cheats to get past. Pit-Fighter (Programmed by Imagitec Design). An early demo of the game has been found, with crude graphics, no sound and poor collision detection. Rescue on Fractalus! (Programmed by GCC). A conversion of the popular computer game was released by GCC in 2004. The game was partially complete with a running engine but no enemies. Other 7800 games remain lost, despite indications that development occurred. The most notable of these are Skyfox (shown on the back of the original system box) and Electrocop (artwork has since been uncovered). Engineering Notes list Tempest as a game that was between 15-20% completed for the Atari 7800, no code to date has been found. The Atari Museum located and posted unreleased box art and notes for a 7800 version of Crystal Castles. No code to date has been found for that game either. Atari's earlier 7800 games listing showed Millipede as one of the games in the line up, however it does not appear that it was ever started or worked on. Source code to 13 games, as well as the OS and development tools (for the Atari ST computer system) were discovered in a dumpster behind the Atari building in Sunnyvale, California. Commented assembly language source code was made available for Centipede, Commando, Crossbow, Desert Falcon, Dig Dug, Food Fight, Galaga, Hat Trick, Joust, Ms. Pac-Man, Super Stunt Cycle, Robotron: 2084 and Xevious game titles. Atari CX7800, two joystick ports on lower front panel. Side expansion port for upgrades and add-ons. Bundled accessories included two CX24 Pro-Line joysticks, AC adapter, switchbox, RCA connecting cable, and Pole Position II cartridge. Atari CX7800, second revision. Slightly revised motherboard, added an additional timing circuit. Expansion port connector removed from motherboard but is still etched. Shell has indentation of where expansion port was to be. Atari CX7800, third revision. Same as above but with only a small blemish on the shell where the expansion port was.